Before the summer holidays the result of the Translator Wanted 2018 competition was announced. As in previous years there was a lot of food-based hilarity. You can browse through all the 2018 entries on this Wakelet board. Congratulations to all the eager-eyed participants! I find that I have become so accustomed to merely approximate translations in everyday life that it’s easy not to notice them at all. Today I was reminded of this fact by my friend Javier Leiva, who picked up the flyer in the photo with “Back to school” special offers. 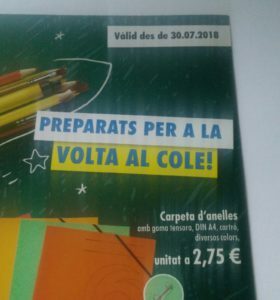 In this case, it seems that the automatic translator has turned Spanish “vuelta al cole” into Catalan “volta al cole”, in other words, not going back to school, but going round the school. Printing the flyer in Catalan is a nice touch but messing up the translation rather undermines the endeavour! 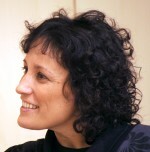 This entry was posted in Catalan, Computing tools, Profession. Bookmark the permalink.